The Young and the Restless (Y&R) spoilers for Wednesday, June 13, tease that the arbitration will continue, which means it’ll be time for Sharon’s (Sharon Case) turn on the hot seat. Michael (Christian LeBlanc) will start by grilling her about Victor (Eric Braeden) and his relationship with his grandkids. Sharon will be forced to admit that Faith (Alyvia Alyn Lind) moved in with Vic a while back. Michael will also bring up Sharon’s history. He’ll talk about her mental illness and the crimes it drove her to commit. Sharon will argue that she’s got a grip on her bi-polar disorder. However, that Fairview stint after her miscarriage will come back to haunt her. Michael will add that Sharon lied to Nick about Christian (Jude and Ozzy McGuigen) and tried to keep him in her own home. He’ll suggest that Sharon just wanted to get her hands on Christian again and that’s why she reunited with Nick (Joshua Morrow). After Brittany (Lauren Woodland) tries to undo the damage, the arbitrator will ultimately have good news and bad news for Nick. There’ll still be hope since the fight isn’t over, but things will definitely take a turn in Victor’s favor. Due to the revelations about Sharon, Vic will be awarded temporary custody of Christian. The arbitrator will insist that permanent custody will be determined later. At the athletic club, Abby (Melissa Ordway) will open up to Lily (Christel Khalil). She’ll talk about her issues with Arturo (Jason Canela) and reveal that they’ve parted ways. Lily will get why Abby’s hesitant, but she’ll think it might be worth it to push past her doubts. Afterward, Arturo will grow frustrated over a botched business deal. When Abby gets the scoop, she’ll once again believe Victor’s to blame. Abby will promise to take care it before offering Arturo another chance. He’ll happily take it, so they’ll share some steamy lip locks at The Dive Bar. Other Young and the Restless spoilers say Jack (Peter Bergman) will get some help from Neil (Kristoff St. John). He’ll receive a few of Dina’s (Marla Adams) old diaries, which were found in storage at Hamilton-Winters. Jack will be nervous about looking through the pages, but he’ll decide he has to get answers. He’ll find some interesting clues about his biological father in Wednesday’s episode. Jack will read about Dina having a fight with John (Jerry Douglas) and meeting a handsome man on the terrace. He’ll learn they shared a dance as well as a kiss that night. Later entries will reveal Dina’s hot Stardust Inn encounters, but the man’s name will be ripped out. 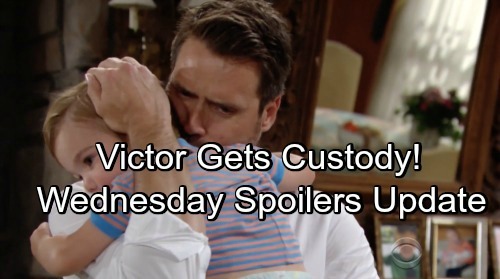 Y&R spoilers state that Jack will hope to track down the missing pages. He’ll feel like they could be crucial pieces of this puzzle. The Young and the Restless fans won’t want to miss the rest of Jack’s mission. We’ll give you updates as other Y&R details emerge. Stick with the CBS soap and don’t forget to check CDL often for the latest Young and the Restless spoilers, updates, and news.